Quit floundering around with your outdoor graveyard scene and add a seriously spooky decoration that will make your house guests gasp. We're not quite sure what exactly happened to this skeleton fish, maybe he was hooked by a fisherman or swam too close to shore and dried out, but we do know one thing: he's drop dead creepy! You'll easily be able to give your home a disturbing aquatic touch by incorporating this fossilized fishy into the mix. You can hang this bonehead on your wall, set it on your work desk, or showcase it on the mantel above a fireplace. Where ever you decide to place this eerie fella' you can be sure it will get plenty of scares and maybe even a gasp or two! 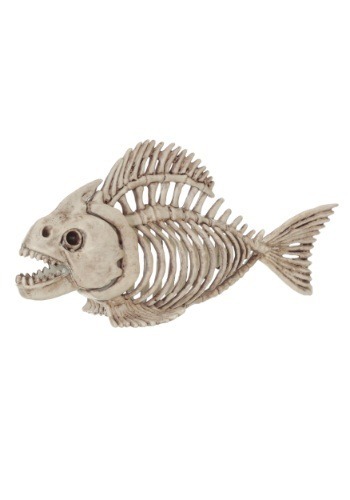 However, don't let your creepy decor stop with this Skeleton Fish. Take a look at the rest of our animal skeleton props and you can transform your loving home into a terrifying nightmare for any visitor.